Support Audio: MP3 / WMA / APE / FLAC / WAV, etc. SD Card Slot, SD card have music into SD connect can to play. Tuner Features: FM 87.5-108MHz. Support USB / SD/ MMC card reader. USB Connector, USB have music into USB connect can to play. There is not CD room for the CD Player. This is not Support CD/DVD Player. This is car radio MP5 player support the USB SD card. And its music quality is better than CD/DVD Player. 7" HD Car Radio 1 DIN Stereo Bluetooth Touch Screen Retractable USB SD AUX FM. DAB Aerial Requires For DAB Radio To Function NOT INCLUDED. 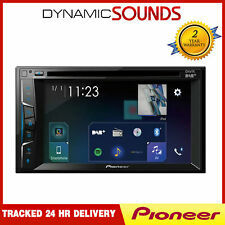 Pioneer AVH-A3100DAB Double Din Car CD DVD Player USB DAB Digital Radio Bluetooth 6.2" Screen. DAB AERIAL NOT INCLUDED. DAB enjoy the convenience of listening to your favourite radio stations in crystal clear digital quality. 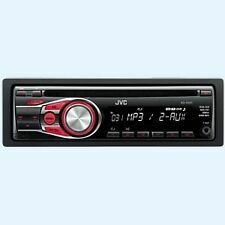 JVC KD-R520 CD Player Dual AUX Car Stereo. Condition is Used, but is in excellent condition.This unit is only about 6 months old ,it lights up in blue . Dispatched with Royal Mail 2nd Class. 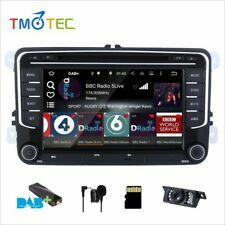 4.1" Single Car MP5 Player Radio Stereo Head Unit Bluetooth FM AUX USB TF 1 DIN. 4.1"1DIN Bluetooth Car Radio Stereo RDS USB/AUX FM MP5 Player Headsfree In dish. 1 DIN Car Radio Stereo USB/SD Head Unit In-dash Bluetooth Audio MP3 Player. Used Alpine CDA-137BTi Bluetooth Parrot Handsfree radio headunit. Boxed and in excellent fully working condition, complete with original manuals, cables, mic, remote, security cage & front trim. Any signs of use will be minor. 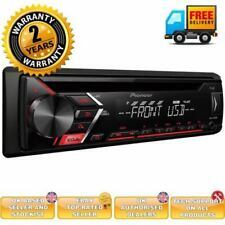 Pioneer MVH-350BT CD MP3 Bluetooth Car Stereo USB Aux In Mechanic-less. This is the best head unit I have had, just copy all your music onto a memory card (get a mini one) and leave it there! The sound is much better than other popular brands I have had in the past. Only reason for sale is an idiot wrote off my van by mistaking my drive as part.of the road. It was installed in a camper van and had limited use. Condition is Used. Dispatched with Royal Mail 2nd Class. PIONEER deh-1600UB car radio stereo cd player Bluetooth,mp3/wma/usb/aux in. 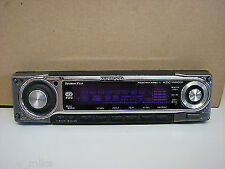 Car radio stereo cd player PIONEER deh-1600UB. Bluetooth,mp3/wma/usb/aux in. PIONEER deh-1600UB. radio-fm/am tuner RDS. Bluetooth adaptor handsfree phone calls & streaming audio. other mp3 players. So, this is a Renault only stereo. And it does not fit! Removal Tools. Wiring Harness. Faceplate Surround. JVC Single Din Car Stereo. Condition is Used. Dispatched with Royal Mail 2nd Class. Pioneer DEH-1900UB - Car stereo with RDS tuner, CD, USB and Aux-In (19). Condition is Used. Dispatched with Royal Mail 2nd Class. Just had this taken out of my vehicle by an auto electrician. Its a radio, DVD player, bluetooth enabled etc. Its in excellent condition. I'v no need for it now so get a bargain. Alba ICS105 Car Stereo With CD Player. Get radio in your vehicle with this car stereo from Alba. Get access to your personal music collection by connecting a device with a headphones socket. Single CD. ISO connection. PURE highway h260DBi. radio fm/am tuner and DAB radio tuner built in. DAB radio (built in). Bluetooth hands-free calls & streaming music. AUX INPUT for all smartphones & other mp3 players. ForTwo I, Cabriolet, Coupe. Everything works as it should including CD Player and radio tuner. SMART RADIO. RADIO & 1CD PLAYER. /BE AWARE - THIS IS SECURITY MARKED UNIT/. This unit was fully tested/serviced on professional bench. Bluetooth Car Stereo with hands-free calling function. Used but still in Great external condi tion. The player been Fully tested. Its in full working order and it`s VERY LOUD.4X50W. Add us to your favourites. We only test the basic cd and radio function (where possible) and that is it we do not test every single button and feature, we get lots of these every week and need to clear them hence starting them off cheaply. Alpine cde-185bt car radio with bluetooth. Condition is Used. Dispatched with Royal Mail 2nd Class. Alpine CDE-175R Head Unit in excellent condition. No wear to any of the chrome. Full working order. Comes with everything you see in the photos. Will be sent recorded delivery. CITROEN PEUGEOT CD RADIO. CITROEN C2 C3 C8 AND BERLINGO. COMPATIBLE WITH CD CHANGER. SHOULD YOU REQUIRE A SECURITY CODE FOR THIS CD PLAYER ONE YOU HAVE I CAN CODE IT FOR YOU. COMPATIBLE WITH RADIO DISPLAY. FITS HYUNDAI TUCSON MATRIX ACCENT GETZ COUPE. SUPPLIED DECODED WONT REQUIRE A SECURITY CODE. HYUNDAI CD RADIO. SHOULD YOU REQUIRE A SECURITY CODE FOR THIS CD PLAYER ONE YOU HAVE I CAN CODE IT FOR YOU. Condition is Used. Th is i s th e st er eo o nl y no other bitsl ik e pl ug s ar e su pp li ed. In g oo d wo rk in g or de r.